Indigenous Rising, photographed by Nadya Kwandibens (Red Works) in partnership with Photographers Without Borders (PWB), is a portrait series featuring Indigenous artists, scholars, media-makers, activists, and survivors whose work centers and amplifies stories of Indigenous resistance, reclamation, resurgence, decolonization, and intelligence. Portraits are accompanied by a message from each participant and will be on display throughout Kensington Market in Toronto for the month of May during CONTACT Photography Festival. Indigenous Rising is also being expanded to a full-length documentary film later in the year. 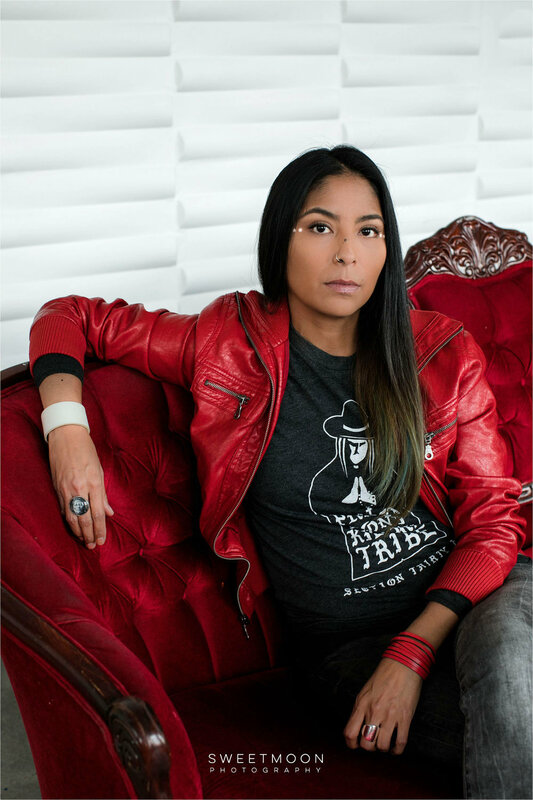 Nadya Kwandibens is Anishinaabe (Ojibwe) from the Animakee Wa Zhing #37 First Nation in northwestern Ontario. She is a self-taught portrait and events photographer and has travelled extensively across Canada for over 10 years. In 2008 she founded Red Works Photography. Red Works is a dynamic photography company empowering contemporary Indigenous lifestyles and cultures through photographic essays, features, and portraits. Red Works specializes in natural light portraiture and headshots sessions plus event and concert photography. Red Works also provides image licensing, workshops, presentations and print products. Her photography has been exhibited in group and solo shows across Canada and the United States. "We, as Indigenous people, are often portrayed in history books as Nations once great; in museums as Nations frozen stoic; in the media as Nations forever troubled. These images can be despairing, however, my goal seeks to steer the positive course. If our history is a shadow, let this moment serve as light. We are musicians, lawyers, doctors, mothers and sons. We are activists, scholars, dreamers, fathers and daughters. Let us claim ourselves now and see that we are, and will always be great, thriving, balanced civilizations capable of carrying ourselves into that bright new day." Learn about Indigenous Rising here.